This is foundation for the foundation-averse. There are a lot of products that come by my desk on a daily basis. I wish I could dedicated more time to each and every one, but often they just blend into one another. But every once in a awhile, there’s something that really stands out, and I cannot stop talking about it with every person in my near vicinity. The latest to catch my attention? 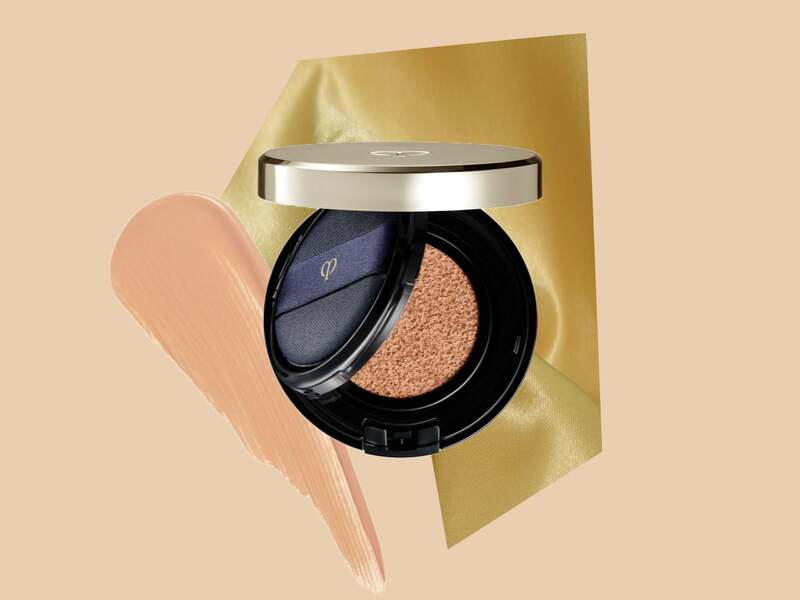 Cle de Peau Radiant Cushion Foundation, $90, which just launched this week. It’s magical for a few extraordinary reasons, but first: what’s a cushion foundation? Cushion foundations are not brand new—they’ve been a staple of Korean beauty for many years—but they’re trending for a few good reasons. The reason they’re so popular is their convenience and brilliant formulas. Convenience in that the foundation housed inside the small compact is nearly identical to a liquid formula, but ready to go: most traditional liquid foundations are in a bottle or glass tube, and usually need a brush to blend—making it a whole ordeal to take on the go. But cushion foundations have a sponge-soaked with foundation, and often added features, like a primer or hydrating product. An applicator is stored above the bottom foundation compartment, which fully closes on its own—there’s a compartment within the larger compact. (It’s also worth mentioning that these cushion concepts are re-fillable, so you keep the sturdy, expensive compact, and just repurchase the foundation insert, which is usually much less expensive.) When you touch the sponge, somewhat similar to a cushion, hence the name, it immediately gives a light to medium coverage, which you apply with your included applicator. And it couldn’t be easier. The foundation application process used to take me several minutes—pour out blend, buff, assure there aren’t cakey spots—now takes literally 10 seconds. I simply take out the applicator, open the foundation compartment, dip the puff two or three times and pat onto my skin. It goes on so easily, so flawlessly, and so effortlessly, with minimal blending. But the glow is what keeps me coming back. I haven’t picked up another foundation since the day I tried this. The coverage is light, but it implements such a luminous, no-makeup makeup glow that I’m practically shouting from the rooftops about it. This is foundation for the foundation-averse. Case in point: I converted a non-foundation-wearing colleague who began using this after she saw how easy and flawlessly it worked after watching me touch-up mid-day (and after she endure my constant chattering about its brilliance). Most cushion foundations do have a hydrating feeling, so it is maybe a bit more ideal for dry to normal skin. That being said, I have quite oily skin, and I still love this hydrating, medium coverage. I just use a oil-absorbing sheet midday for any excess shine if it’s bothering me, otherwise I just rock my overall dewy, perhaps a bit oily, glow. The downside? The Cle de Peau option is pricey. It’s designed with a flawless with 24-hour moisture formula that gives a seamless application. I’m obsessed, but there are plenty of other options on the market to test out, too. The most popular beauty brand in Korea, Innisfree, has two incredible cushion foundations—one matte and one moisturizing, both $12—with an insane 71 different designed compact case options (from printed leather to lightweight plastic options, most around $10). The reason for the price being higher for cushion foundations than normal foundations is the permanent case, which is the real investment here. So it’s worth testing out options at department stores and Sephora to assure you like the coverage of any compact you’re considering. Once you discover your match and fall in love, you can then repurchase the replacement for a much lesser price. For example, Dior’s new Cushion Foundation, $82, is another real investment. But the dreamy, glowy refill is $42. So you are paying $40 for the compact itself, so make sure you love the formula. But when you run out after a month or two of use, you’ll only then have to pay the $42 to refill for the end of time. All in all, test it out next time you’re at a beauty store, see what you think. In the meantime, I’ll be over here, talking to anyone listening about how great my new, bouncy, glowing foundation is.